At our dedicated cleaning test centre in Maidstone, we have the latest demonstration and test facilities to develop cleaning processes tailor made to the customer's requirements. We are able to undertake free of charge cleaning trials using a large variety of cleaners and solutions. It’s important to tailor a complete cleaning solution to match a specific application as this ensures that the cleaning costs, both power consumption and consumable costs, are kept to the minimum. For example, a general purpose cleaning detergent may successfully clean contaminated components, but if it’s not targeted specifically for the job, you could find the detergent need replenishing far more frequently than a tailored product. Kemet can offer over 300 different detergents, all with slightly different characteristics, to ensure the optimum efficiency of your cleaning process. We provide a complete technical support programme as part of the Kemet package. In the UK, our team of Technical Representatives is always on hand to offer advice and assistance. 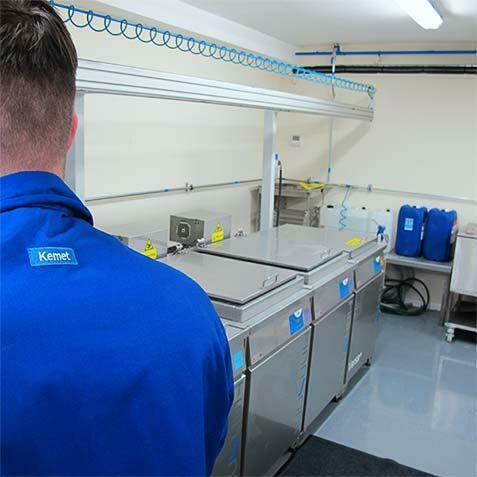 Internationally, our world-wide network of Kemet subsidiary companies and exclusive distributors have fully qualified technicians and engineers to help solve your ultrasonic cleaning problems.